Call (800) 572-4728 for best pricing OR Request a Quote. Short Description: Henny Penny rotisserie simply cooks faster. Patented THERMA-VEC® Even Heat Process combines cross-flow convection cooking with radiant heat. The result is thorough, even cooking with uniform browning in a lot less time than other rotisseries. High quality stainless steel construction, exterior and interior. 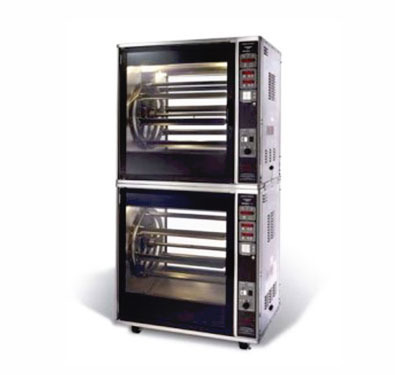 Gentle, cross-flow convection for even cooking throughout cabinet. Radiant heat for uniform browning and crisp texture. Digital electronic controls with 9 programmable cook cycles for each cabinet, 18 total. Programmable browning and texture control. Large LED display for simultaneous time and temperature. Spit rotation switch for easy loading.